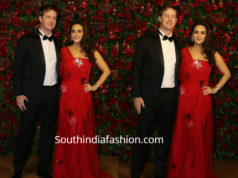 Preity Zinta attended Karan Johar’s Diwali party wearing a cream and gold combination sharara suit by SurilyG. 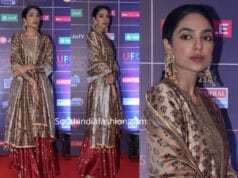 Traditional gold jhumkas, matching potli bag and side swept curls rounded out her look! 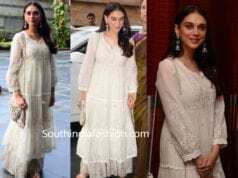 Aditi Rao Hydari’s ethnic look!